‘It’s like two old men trying to recapture their youth’ I may have said this to @hitmanharris as we both hobbled round the Summer Breeze Half Marathon in agony. 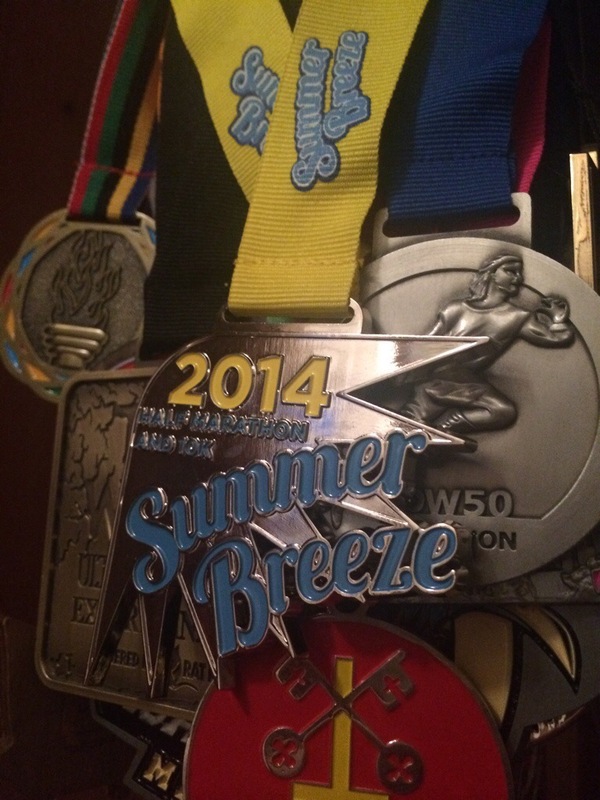 I’ve lived very close to Wimbledon Common several times but never really took advantage of the fun it offered and so when it was suggested we should run a half marathon the Summer Breeze looked like good old fashioned fun. We lined up with the other runners with just a couple of minutes to go – rather meekly making our way to the back of the group. I don’t think either of us where under any illusion that this was going to a fast race. We had made the mistake of picking a wet, hilly, tough trail half marathon and I was still recovering from the beating that my physiotherapist had given me and my companion has a, to quote him, ‘fat arse’. We had a loop or two of the field we began in at the off which was both a bit dull and worse congested. I tried to make headway through the crowds to keep us at pace but I could see HH getting caught up in traffic and so eased back to rejoin him. I put a bit of a spurt on though as we hit the trail and dropped our average time to just over 5 minutes per kilometre but we soon pulled this back a little to account for the heavy going. Once through the initial loops of a field the trail really opened up to us and we were able to find a pleasant rhythm. 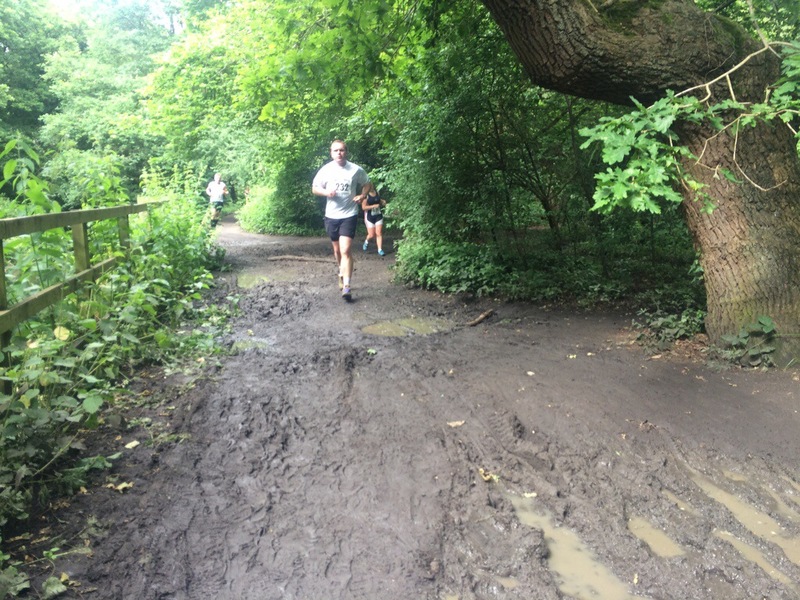 Hills greeted us at regular intervals and there were thick pools of fantastic mud that most runners tried to sidestep – much like HH, I however, gave it full welly through the mud and both myself and my Hoka enjoyed it just fine. ‘I’ll see you at the top of the hill’ I called back to HH and thundered away up the hill having seen an excellent photo opportunity. I grabbed my phone and waited for my running companion to make his finest strides across a giant log and ‘snap, snap, snap’. Phone away, off we go. It was just after here that my dicking about proved my undoing. I saw HH clambering up a series of short steep hills and so to prove my worth I strode manfully beyond him and exploded my groin in the most painful of fashions. Hmmmm was my immediate thought – 4km in, 17km to go, this doesn’t look good. The ground was making for slower than I’d have liked progress and we were behind time. The heat and minor injuries were playing their part in HHs slower progress and my groin was sending shooting pains both up and down my body. Regardless I didn’t want to let this be the end and so pushed HH as hard as possible and we completed the first 10.5km in a semi respectable 1hr 2 minutes. I could continue to feel the stinging and burning in my groin and knee that tomorrow my physiotherapist was going to have a field day with me but there and then I remained focused. We pounded past the field for lap 2 and back into the mud. By now I have vocalised the problems I was suffering with but still managing mainly running and we only stopped at the bigger inclines or to negotiate the heavily cut up course. Being at the back of the course meant that we could just amble along and not be too distressed by our placing but at 17km I thought I might have to DNF – the pain was searing and only having a companion with me stopped me from weeping but otherwise I’d have curled up in a corner and stayed there. Credit where it’s due, UltraBoy and Hitman pushed each other through the final few kilometres, up and down hills that in truth neither of our old broken bodies enjoyed and even as we came back into the field there was no sense of elation it was more a case of needing to finish. In the distance I could see HHs family and so to ensure that we finished well, despite our beleaguered performance, I pulled out a fast finish and called out that HH should follow – he sort of did. We both crossed the finish line (I with my camera out to capture the end of this epic race). We both slumped to the ground upon crossing the finish and despite a dreadful time it was a job well done. We collected our medals, T-Shirt and banana and headed gingerly towards the exit to watch the final few stragglers come home. So despite my own performance what a bloody fun run it was. 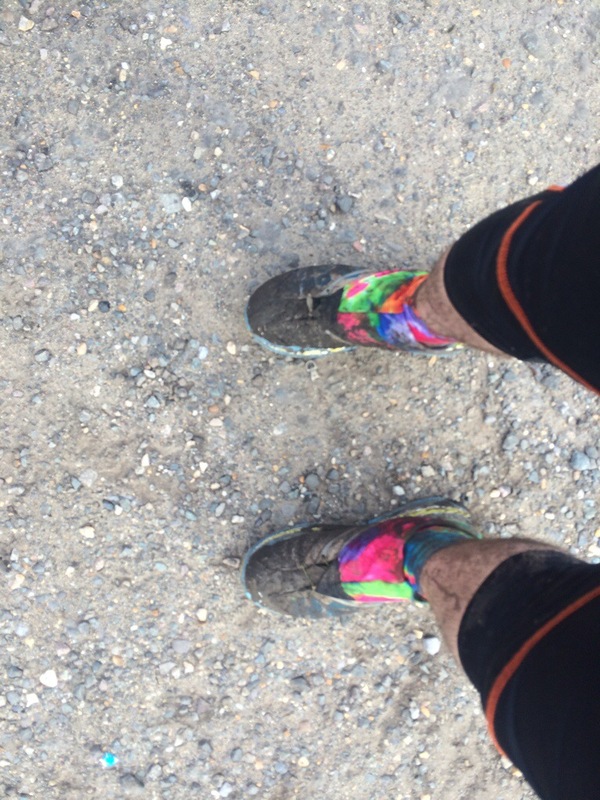 I loved the hills, I loved the oodles of mud and I really loved the course. 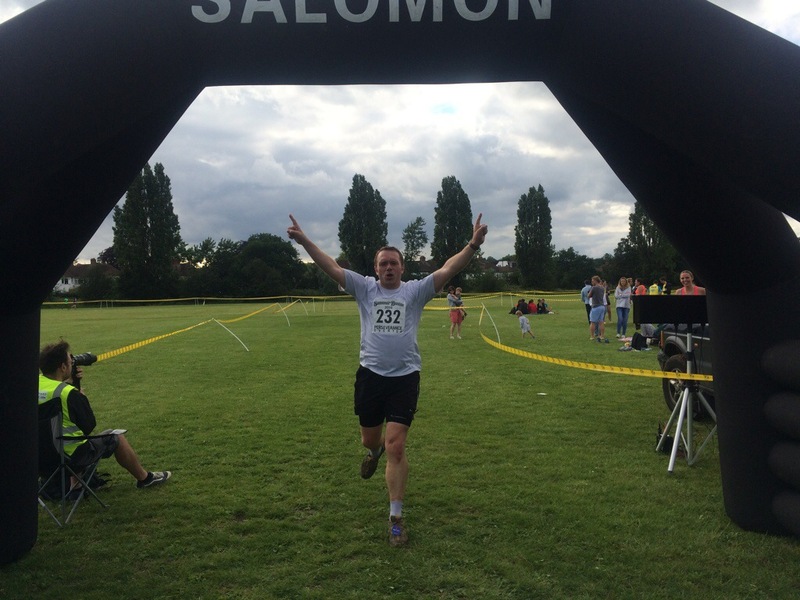 There was a certain amount of excitement throughout the day and it was all extremely well organised with just enough facilities around to make it pleasant for both runners and spectators. The day was helped by the fact there were three races taking place over the course but it was all nicely spread out and nobody felt crowded or pressured, even my minor gripe about a slightly stop start beginning shouldn’t detract from the fun that this was. The medal and the TShirt were especially brilliant and for the money I think this was an excellent value race and will be looking forward to it again next year. Well done chaps and well done @hitmanharris for persevering. 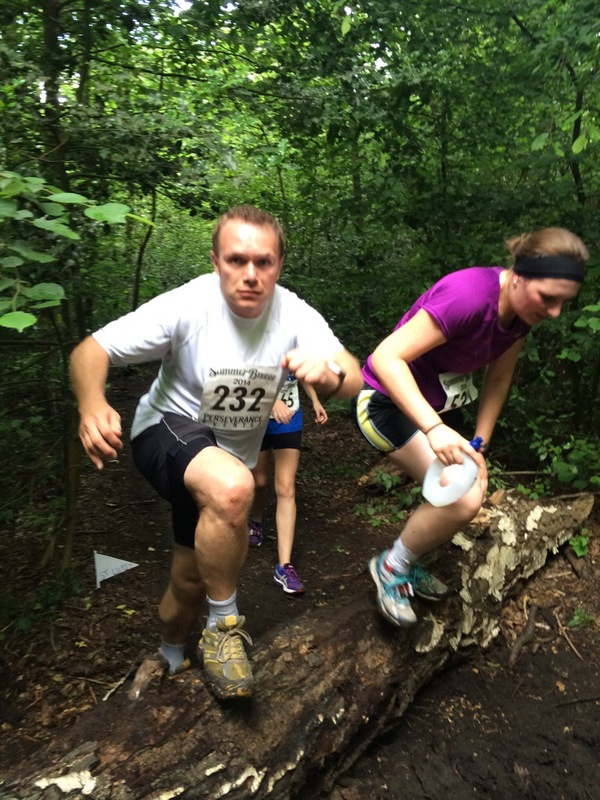 My problems with the race are as follows -Too hot, too hilly, too muddy, too unfit, too fat, too old. Apart from that it was fine. Great race. Great medal. Well done.